Chronicle is a really good movie. I’d suggest seeing it in theaters because the special effects and the flying scenes are awesome and it won’t translate the same when you watch on a smaller screen at home. It’s a very short film at 1 hour and 23 minutes but this movie never feels rushed. The plot arrives at the major conflict pretty quickly and then the action scenes pick up in frequency and intensity. Let’s get started! Below, from left to right you have Matt (Russell), Steve (Jordan), and Andrew (DeHaan). This movie follows the “found footage” format. Andrew Detmer starts filming his life, and we watch him deal with loneliness and bullying at school, an abusive father at home, and a mother who is slowly and painfully dying from cancer. Steve is the school’s super-popular quarterback, and he finds Andrew sitting outside. Steve persuades him to come film something that he and Matt found in a wooded area nearby. This next part might be a little frustrating for some people. This film shows what the three teenagers find, but it offers no explanations about what it’s made out of, how it got there, and why they developed telekinetic powers after encountering it. 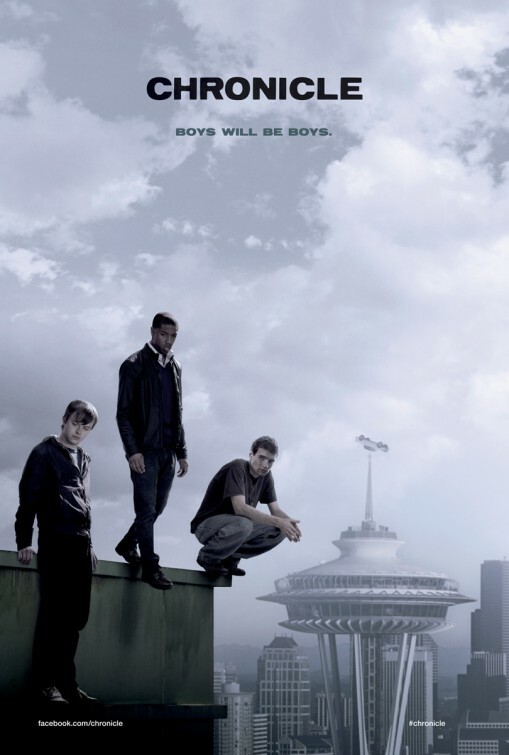 This film is only focused on how the three boys use their new powers. At first it’s all fun and games, and the boys use their mental strength to play innocent pranks on people in stores and at parking lots. They also teach themselves how to fly, and whoa! The flying scenes are awesome and very enjoyable. Yes people, in the picture below you can see the boys up in the air with Seattle’s Space Needle. And yes, that’s a car on the tip of the needle. You’ll have to watch the movie to find out who put it there! As expected, the situation gets a little hairy once one of the boys (*cough* Andrew) realizes his powers can be used for revenge and torment. The boys are riding down a back road and a car starts tailgating them and honking obnoxiously. Andrew casually runs the car off of the road and for the rest of the movie all hell breaks loose. I have no complaints with this movie. I loved the acting, and especially loved DeHaan’s portrayal of a bullied and abused teen who finds an unfortunate release for his frustration and anger. The actors had a great chemistry and they successfully sell their friendship (there’s no way they would be friends if they didn’t find the thing in the woods). If you have seen the movie, tell me what you think! 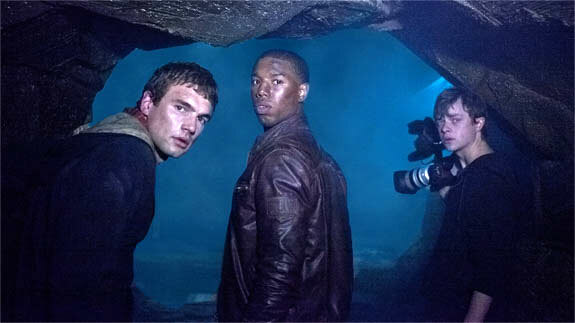 Some trivia: Josh Trank is 28 years old and Chronicle is his debut feature film. This month, the film reached #1 at the box office. Steven Speilberg was 28 years old when he scored a #1 hit with Jaws. I’m not saying Trank is the next Speilberg, but I am saying Trank is heading in the right direction with his directing career.